Square Hebrew characters printed in double columns, citations from Bible provided with nikud. ff. 146 (of 149, lacking the first and final two leaves). Stained, marginal paper repair in places, a made-up copy, penciled foliation erroneous. Later calf. Sm. folio. Vinograd, Salonika 45; Mehlman 1254. 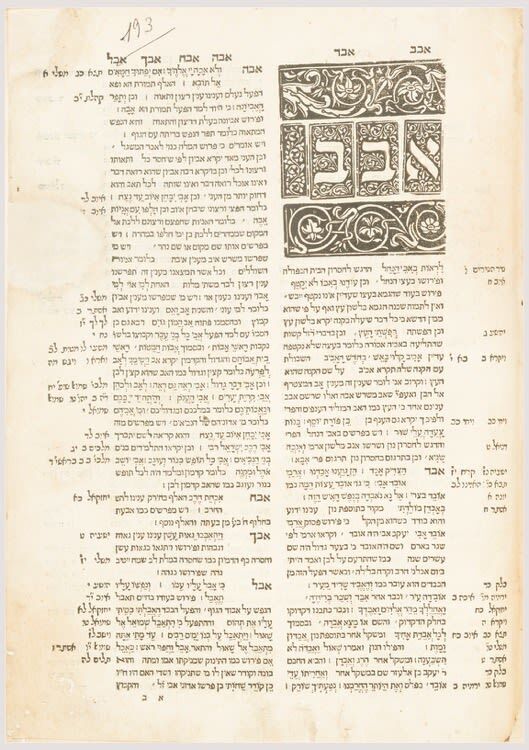 Salonika: Gershom ben Moses Soncino, (1534). A censored copy. For example, under the entry “elem”, the author, quoting his father R. Joseph Kimchi, derides the Christian assertion that the word “almah” (a young girl) found in Isaiah Chap 7:14, refers to a virgin birth. In this copy, the citation quoting “Yeshu HaNotzri” (Jesus) was vehemently struck out by the ever-watchful Church censor.